The meaning of the Vratam is a “Vow” or “Resolution.” When you undertake the Vratam for your pilgrimage to Sabarimala, you are taking a vow or a resolution to perform a certain set of activities and a vow or resolution to not perform certain other types of activities. The donning of the traditional black, blue or saffron clothes during the Vratam period has its own significance. Blue: First the Lord is described as Neela Megha Shyamala Varnan. Most devotees wear the Blue colored Mundu, to associate themselves with the Lord. Black: Lord Saneeshwara is ebony black in colour. And those people (Ayyappa Swamis) who suffer from Sani Doshams, are instructed by their Guruswamis to wear black Mundus, so that they may be released from Sani’s maleficent effects. Apart from this they are also guided to chant the 12 stotras that are pleasing to Saneeswara as they climb the Sabari Malai so that when the Ayyappa Bhakthas reach the top, Sani Bhagavan would have removed himself from their lives. White: Those who without any self interest devote their attention entirely on Him, wear white veshtis, as they consider Him as Nirguna Bhagavan. Wearing the colored Mundu also has the added advantage of letting the others know that you are observing the Vratam. This is especially important as it relates to letting women know, so that they can distance themselves from the males who are observing Vratam. The purpose of the Mandala (one mandalam = 42 days) Vratam is to cleanse the body and soul of the devotee and to prepare a devotee both physically and mentally for the journey. A number of Ayyappa devotees are under the impression that they must desert their homes and stay in a secluded place while observing Vratam. This is not applicable in the present day. It was in vogue in those years in Kerala, where devotees used to go and stay in the temple mandap during the Mandalam season. The reason for that was due to the non availability of space for the women folk in their houses to be away from the main house during their periods. This was practiced during 1950s and 60s. The most important thing to be observed is Celibacy and chanting of Saranams. All other things are secondary, including food habits. Of course, you have to follow strict vegetarian food. Some people avoid onion and garlic because they are considered to be aphrodisiacs; otherwise all other vegetarian food is allowed. In those days, there was no short cut. One had either to trek the Peru Vazhi (periya paadhai – 60 KM) or the Pullumedu route, which was originally longer and tougher than the present day route. People used to return all the way through the Peruvazhi, after having Dharshan. In the present day, devotees have the option of trekking the Peru Vazhi or trekking the 7KM journey from Pampa to Sannidhaanam. In either case, you will be trekking through extremely steep mountains and wading through large crowds. Take bath in cold/ lukewarm / room temperature water twice a day if possible – you don’t get hot water in the forest! Pray/ meditate to Lord soon after bath (twice a day) – prepares you for the mental journey. Pray to the Lord before each meal and thank him for the meal. 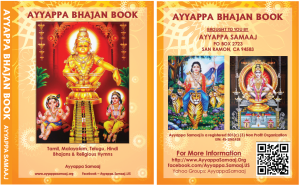 Lord Ayyappa is considered to be Annadhaana Prabhu. Try and feed the poor whenever possible. If you are living in the US, you may consider making Prasadam and taking it to the temple and distribute the Prasadam to other devotees. Avoid consuming processed or packaged food. This only hurts your body. You should try and condition your body to be in as perfect a state as possible in preparation of the pilgrimage. If practical, devotees should eat only food cooked fresh at home by a person who had showered and prayed before preparing the food. Previous day food is considered to be stale and should be thrown away and not consumed whenever possible. Eat fresh fruits in lieu of chips and other “junk food.” Onion, Garlic should be avoided because of they are considered to be aphrodisiacs.